I first baked these tasty muffins ages ago. In fact, they were one of the very first recipes I used from Whole Foods website and they have faithfully remained a regular part of my online recipe box. But like many great recipes, even these muffins have gotten overlooked and passed aside for newer, more exciting recipes. Until this weekend that is. Before my parents left for their Alaskan cruise last week, my Mom brought over a ton of produce she didn't want to go bad while they were away for 10 days. So there I was, a fridge full of food and not enough meals in the day to consume it all. And that's why I decided to dig deep into my recipe archives and bake up these Carrot Apple muffins. After all, there's not much else I could do with two bags of shredded carrots! And it's lucky I did because I had forgotten just how much I love these little guys! 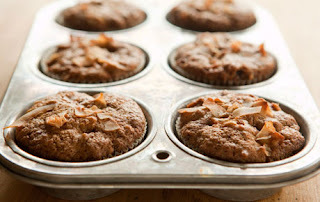 A truly understated muffin that subtly fills your senses and nourishes your body. They're not too sweet, which I can appreciate for a breakfast item. Plus they contain all whole wheat flour, yet remain perfectly moist thanks to the applesauce. I think this recipe would also make a delicious bread, if you prefer that to muffins. My favorite way to enjoy these muffins is heated with a drizzle of agave nectar - YUM! Preheat oven to 350°F. Butter and flour a 12-cup standard muffin tin or use muffin papers. Set aside. In a large bowl, whisk together flour, sugar, cinnamon, baking powder, baking soda and salt. In a separate bowl, combine carrots, applesauce, eggs, milk, oil and vanilla. Add half the carrot mixture to the flour mixture, stir until blended then add the rest pf the carrot mixture. Stir in walnuts. Spoon batter into muffin cups and bake about 20 minutes or until a toothpick in the center of a muffin comes out clean. Serve warm.